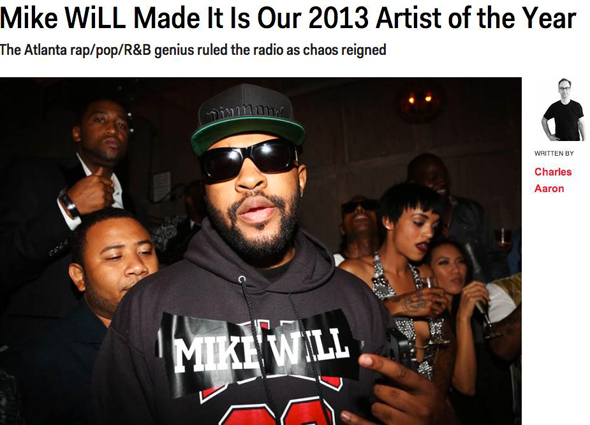 Mike WiLL Made-It has been named SPIN magazine’s 2013 Artist Of The Year. The award comes after a year in which the super producer continued a run that started in 2012, producing over a dozen Billboard-charting singles, working with artists including Jay Z, Kanye West, Rihanna, Lil Wayne, Future, 2 Chainz, Juicy J, Ciara, Ace Hood, and more; he executive produced Miley Cyrus‘ Billboard-topping album Bangerz, producing eight songs from the album, including lead single “We Can’t Stop,” recently certified double-platinum by the RIAA; he released his own debut single, “23,” which features Cyrus, along with Wiz Khalifa and Juicy J, and which has been viewed over 100 million times on VEVO while being certified gold (and well on its way to platinum) by the RIAA. On top of that, Mike WiLL made his first official foray into audio-visual scoring, providing the track for Nike Basketball‘s new LeBron James commercial, “Training Day,” and with a new mixtape, #MikeWiLLBeenTriLL, planned for release before the end of the year, Mike WiLL is already looking towards a busy 2014 that will see the producer executive produce Future’s sophomore album, Honest, while also releasing his own debut album, Est. In 1989 Pt. 3, and officially launching of his Eardruma Records imprint.